I got the idea from over the hill cakes on this site. my aunt wanted this cake for her friend. She was turning 50. It was made with buttercream and covered with a chocolate ganache. 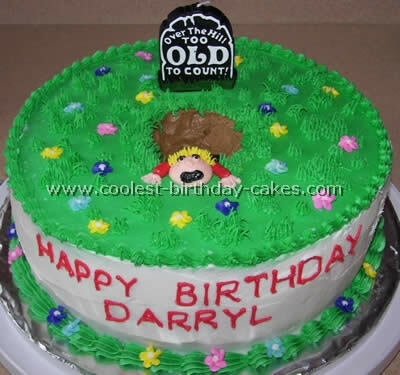 The first two pictures are of my first over the hill birthday cakes. I made this cake last year for my boss. The cake is 1/2 white and 1/2 chocolate. On the left the over the hill is a hill I made out of snow balls. On the right I hand made the tombstones and bought the garden tools and the rocker at a local craft store. 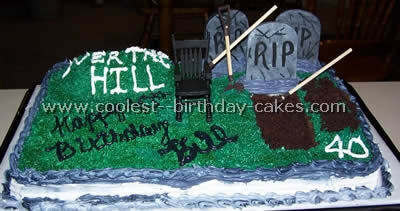 The grave sight is actually dug up out of the cake (the chocolate side of course). The dirt on the cake is pieces of chocolate cake. 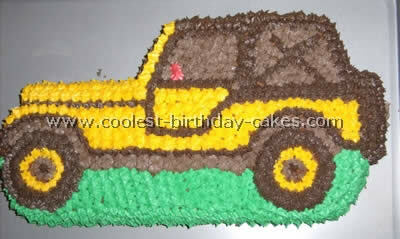 The third picture is a cake I did for a friend who saw the first one and wanted one like it for her boss. 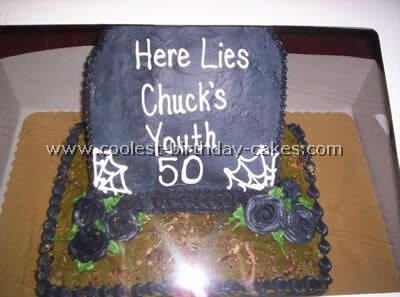 I searched this site for over the hill cakes to make for a friend who was turning 60. It was very easy to make. The cake was yellow at each end and chocolate in the middle. Grave was cut from chocolate cake and cake was crumbled to make the dirt. Then, the grave stones were mold raspberry flavored white chocolate colored with powdered coloring. Finally, the rest was done in buttercream icing. 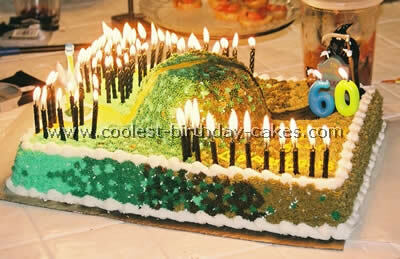 Fun Cake with 60 Candles! 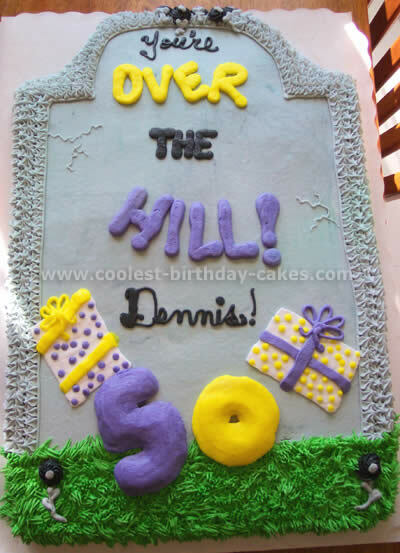 It was my dad’s 60th birthday and we thought that over the hill cakes would be suitable for this occasion. So, we searched this website and came up with this cake. It was two cakes that I put together with frosting. The base is a half-sheet (I think), which was two 1/2 cake mixes, and the hill was one cake mix in my batter bowl. I frosted the base cake first, stuck the “hill” where I wanted it, and then I frosted that as well. 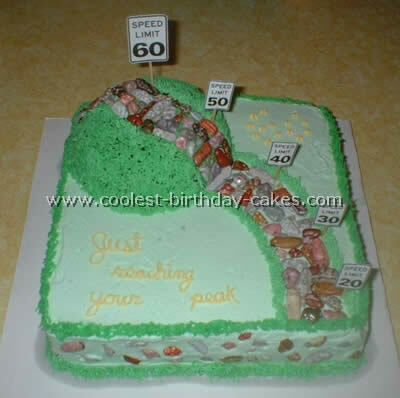 Once I had a layer of frosting over the whole cake (I think I used a taupe or tan frosting), I outlined where the path would be, then I used a star tip to go over the whole thing (except the path) with the colors that fade from green to brown. I found using the star tip easier and more effective than trying to blend that many colors–I’m not very skilled with blending like that! After the ground was done, I used a #3 or #4 piping tip to fill in the path, and then I dipped my finger in corn starch and smoothed the path out. I used two statuettes I got at a cake decorating supply store for the beginning and the end of the path and the cake actually says, “Welcome to Your Golden Years.” I’ve seen some cool variations of this with wording like, “its All Downhill from Here,” or just “Over the Hill.” I also thought about cutting the hill cake in half vertically so that it was just a shear drop on the grim reaper side. I would have done a sign that said “60 and Over” at the top. We actually placed and lit sixty black birthday candles on the cake. It was probably a fire hazard, but it sure was fun! 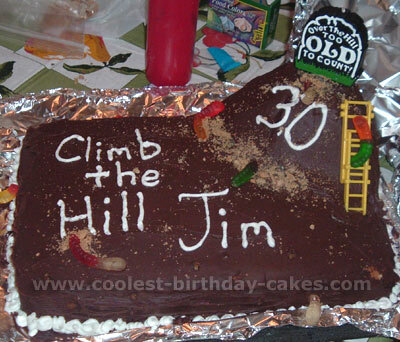 So, have fun with your own over the hill cakes! This cake was for my father-in-law’s birthday party. I got this idea from the Wilton web site for over the hill cakes and improvised a little. The over the hill tombstone is a candle purchased from my local grocery store. The cake is a two layer 10 in cake iced in butter cream. The drop flowers are also butter cream but they need to be made a day or two ahead of time and put in the refrigerator to get hard. Before I iced the cake I took a very sharp paring knife and cut a small hole in the center of the cake being careful not to cut so deep as to cut into the filling. Then, I iced the hole/grave in chocolate frosting. The top and sides were then iced smooth. I then piped the man climbing out of the hole. I used a multi-holed tip to add grass. Printed the message on the front and then finally added the hardened drop flowers. This cake was pretty easy. The only problem that I had was that I iced to top green first and then iced the sides white and I had issues with the green trying to bleed into the white. Otherwise this cake turned out great and everyone got a big hit out of it! Over the hill cakes are so much fun to make! For the bottom cake: 1/4 sheet iced tombstone: cut out of a 1/4 sheet and tilted on top of bottom 1/4 sheet by placing a cake ladder behind the tombstone to keep it standing. It’s also supported by wooden pegs. I placed the cake together first then iced out all together. 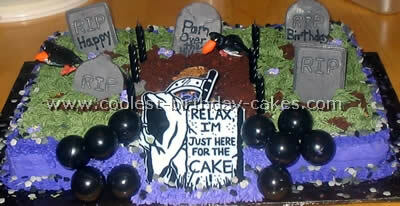 I put a small border around the tombstone and cake, black roses and then added the writing. 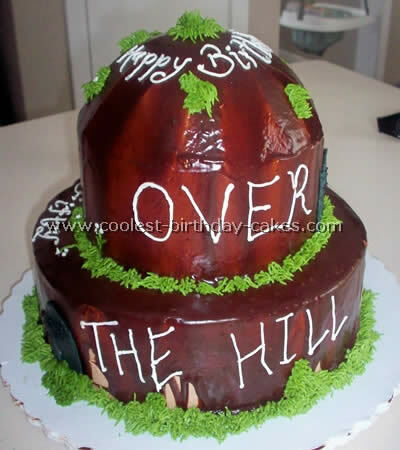 Thanks for all the great over the hill cakes on this site that provide so much inspiration for everyone! As you can see, over the hills cakes, is for somebody coming on in age. The cake was made with a 10″ square cake pan. I baked the hill in a Pyrex bowl. I used a grass tip for the borders the edge of the path and the hill. The rocks are chocolate rocks I bought at a grocery store. I just printed the signs off my computer and taped them to toothpicks. I used a 9×13 sheet cake and just cut off the top corners rounded to resemble a tombstone. The ‘50’ are cookies cut out of slice and bake in the shape of numbers. I used a grass tip for bottom. I got this idea from a Wilton book. Two Over the Hill Cakes in One! 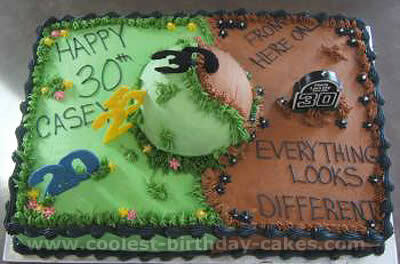 A 30th Birthday Over The Hill theme. Basically it is always “Greener on the other side” of 30! The numbers, 20..25..30 are made from candy melts. The actual cake was 1/2 white and 1/2 chocolate as well. 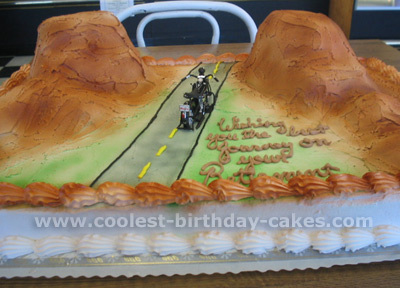 This cake was made for a man who was retiring and wanted to travel. I got this idea out of a magazine. They actually used two 13×9 sheet cakes. I used a boxed cake and I only used one baked in a 13×9 pan. I cut the shapes out accordingly, using the extra for the dirt. Then, I tossed in the extra in the food processor to crumble it up. I secured the two pieces together with toothpicks. Then, I used white frosting and tinted it until I was satisfied with the gray color. I reserved some of the un-tinted icing so I could use it for the grass and decoration. Finally, I topped it with gummy worms and wrote with black gel icing. 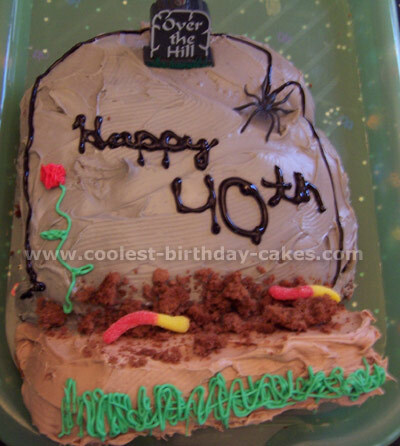 This cake was supposed to be a Halloween cake but I used it for my mothers 40th birthday. I made two 9×13 cakes, one for the base and one for the hill. For one of the over the hill cakes I cut the corners off and glazed those corners so that it wouldn’t crumb. I used chocolate fudge icing and covered the one I didn’t cut up. Then, I made the corner of the cake look like a sort of pyramid (I cut off the corners and flattened the top). I did this by using icing to make it stick together. Then I crumbled up some chocolate chip cookies and sprinkled them over the cake. I used a toothpick to make holes and stick worms to look like they were crawling in and out of the over the hill cakes. I left some of the cookie pieces big, to look like stones. 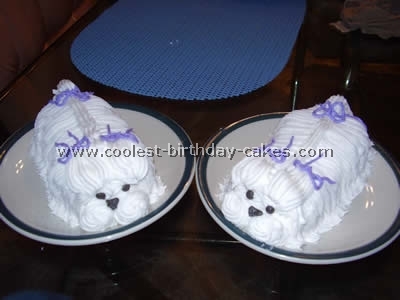 Then, I used plain white icing for decorating all around. I used the ladder to “climb the hill” from a toy I found at the dollar store. I then topped the hill off with an Over the Hill cakes candle.